today's game didn't exactly go according to plan. Blake was very sick the night before with some sort of virus and didn't sleep at all. He suited up but did not start and did not take the field. It meant that a rearrangement of the OL took place and that had ripple effects for the game. Despite going up and leading at the beginning of the 4th quarter 41-20, Michigan State came back and Baylor was unable to score or close out the game. The Baylor OL gave up 5 sacks and that resulted in - 22 yards rushing. You could tell how much Blake's absence played with the ripple effects that it had along the rest of the OL and the offense. Baylor had an excellent passing day but couldn't run the ball and close the game out when it mattered. Blake and Sean are trying to make their way back to Sydney. It can only be speculated that they are devastated by the game. Looking at the bright side, the team did very well over all in 2014 and they return many starters for 2015. They will be ranked solidly and have a great shot at another Big 12 title. preparation is well under way for the Cotton Bowl. One of the bonus' of playing in a bowl game is the gifts that the players receive. This year, the Baylor players will receive a new set of head phones, a set of portal speakers, a $350 Amazon gift card and eleventy billion t-shirts. The bowl schedule will work something like the following for the Baylor Bears. Dec 25th Players will spend xmas with their families. Blake and Sean have a few invitations on spending the day with a few different players' families who are being very generous. Dec 26th The team arrives at their hotel in Dallas. Dec 27th They have a closed practice. Dec 28th Press conference and practice at AT&T stadium. Dec 29th Stadium practice and visit to Children's Hospital. Dec 30th Closed practice and media day. Dec 31st Media events for Coach Art Briles. Fan festivities. ** Blake and Sean will be trying to get the late flight out of Dallas direct to Sydney which means they'll be home for just under 2 weeks. the final gradings are out for the OL unit as published in the Baylor Athlteics media guide for the Cotton Bowl. It really is an excellent document, informative and excellently laid out. Please check it out. As you can see, Blake finished 2nd in the OL grading, behind only Spencer Drango has had an excellent and critically acclaimed season being named as offensive tackle 1st team by Associated Press, USA Today, ESPN, Athlon, Lindy's, Phil Steele.com; it goes on and on. For Blake to be assessed so closely and to actually lead the unit for a large portion of the season bodes well for 2015. There is no word yet on whether Drango, also a Junior, will move on to the NFL draft or not. Blake was also named 247sports.com and Waco-Tribune 2nd team All-Big 12. 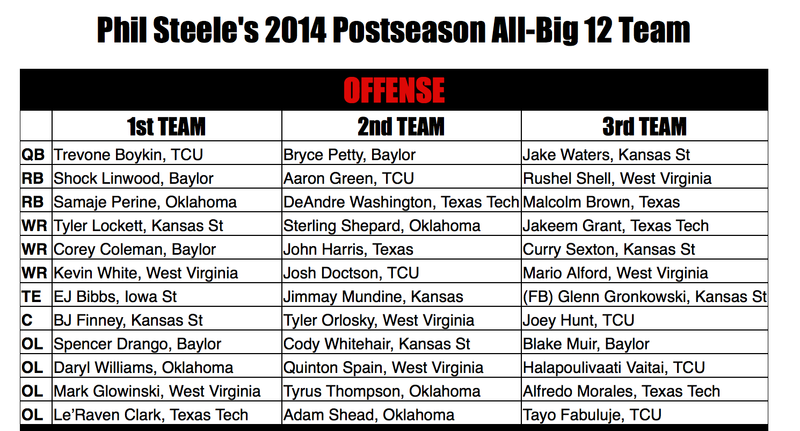 Blake was selected 3rd team All-Conference on philsteele.com for the Big 12. You can see that there were 3 Baylor Bears on the 1st team (Drango, Linwood and Coleman), 1 on the 2nd team (Petty) and 1 on the 3rd team (Muir). For the defense, there were 2 first teamers (Billings and Oakman) 2 second teamers (Hager and Stewart). Spencer Roth was named 1st team Punter. 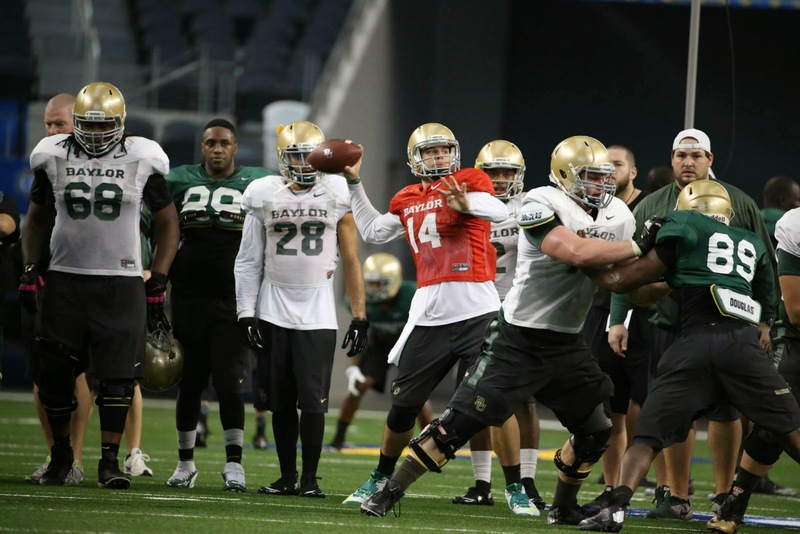 The Baylor Bears prepare for the Michigan State Spartans. Blake and Sean were mentioned in an article in the Sun Herald and The Age about the sport locally and how youth gridiron in Australia positions players for a potential college future. Blake was named All Big 12 Honorable mention at OL for 2014. The first and second team is usually comprised of established players within the conference, by starting all 12 games at Left Guard, and taking his career starts to 24 from 24 games, Blake has a good shot at greater recognition next year. Left Tackle Spencer Drango was named Big 12 co-OL of the year, a 3 year straight streak for Baylor after Cyril Richardson won in 2012 and 2013. No other Baylor OL was named in the 1st or 2nd team in 2014. The final OL gradings have not been released yet, but its a good sign for Blake that he was the highest graded Baylor OL for the majority of the year, and the highest graded Baylor OL in at least 3 of the games; Drango being the highest graded OL in 4 games. This week the boys get ready for finals week and then get ready for the Cotton Bowl. 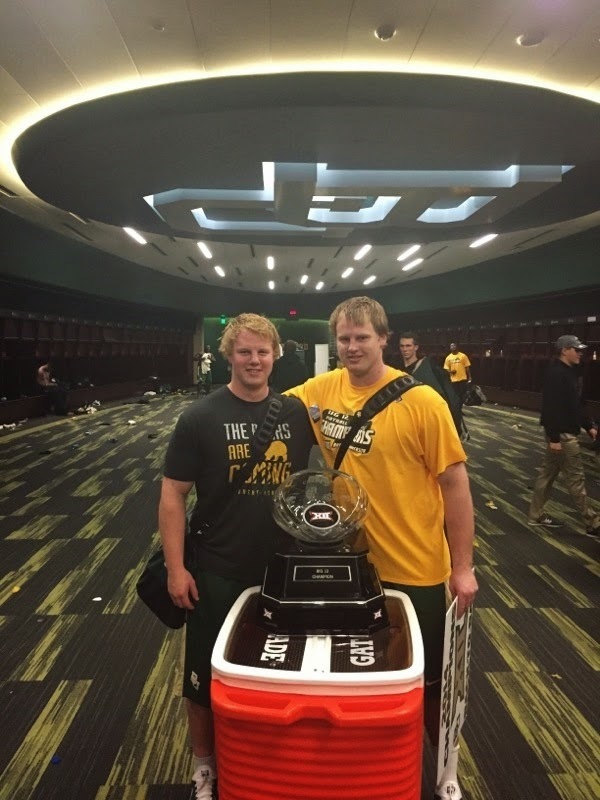 Sean and Blake with the Big 12 Trophy. They will likely be home for a week after the game. Michigan State was a highly regarded team in the preseason before losing 46-27 to Oregon. They pride themselves on being a very good defensive team, 8 of their games they were able to keep their opponents under 20 points; couldn't do the same thing against Oregon though. Ohio State was their only other loss. Despite defeating Kansas State 38-27, the Baylor Bears were not about to make the College Football Playoff, being ranked #5 in the nation. The Bears were dominant but Ohio State of the Big 10 was assessed as being better. Blake played another very good game. The rushing attack and pass protection were excellent. Blake finished the season not allowing any sacks, had one holding penalty when he tripped over a team mates' feet and had one false start; the fewest number of penalties of any Baylor OL who started. As expected, Baylor is in 6th on the College Football Playoff rankings. Surprisingly thought, TCU is now in #3 and Florida State in 4th. Florida State has a tough ACC Championship game against Georgia Tech, Oregon in #2 has a game vs Arizona in the Pac-12 Championship game and Alabama must play Missouri in the SEC Championship game. Baylor of course essentially plays the Big 12 Championship game at home vs Kansas State. Much speculation right nowas to whether Baylor would pass TCU and Ohio State to get into the top 4 with a win on Saturday. Kansas State is ranked #9, the major win that TCU has that Baylor does not. Ohio State plays Wisconsin in the Big 10 championship game. So much to occur in the next 7 days. Here's some clips of Blake from the Texas Tech game. 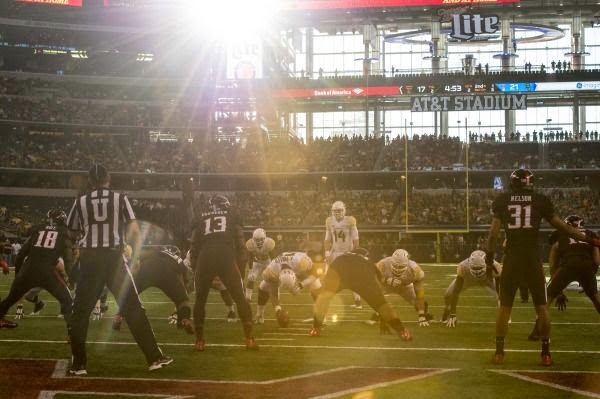 what started out as a comfortable performance got very close at the end as the Baylor Bears defeated the Texas Red Raiders 46-44 @ AT&T Stadium in Arlington Texas yesterday. The Bears suffered a few injuries during the game, starting QB Bryce Petty came out of the game in the 3rd quarter with a concussion but should be okay to go next week. RB Devin Chafin however dislocated his elbow and will be out at least till the bowl game. Which ever one that is. With the loss of Mississippi State, Baylor is now up to #5 in both the Coaches' Poll and the Associated Press Poll. The College Football Playoff Poll (the one that decides on the important top 4 playoff spots) will release their penultimate results on Tuesday. TCU is ranked #4 in both polls, a team Baylor has beaten, and next week the Bears will play #9 Kansas State. If Baylor can win the game, then they will have played as many tough teams at TCU and should leap-frog them into the #4 spot; or higher depending on other results. Blake played possibly his best game since the TCU game. Highlights to follow later today or tomorrow.